MIP fittings, used in conjunction with FIP fittings, are used in countless ways in residential, commercial and industrial piping systems. The materials used to manufacture MIP fittings can vary according to application, so it is essential that the correct materials are selected for each job. If you have professional pipe-fitting training, check with local authorities before altering or installing MIP piping systems. MIP and FIP components are required to make connections in a threaded piping system. An MIP fitting is one of two components in heavy-duty, threaded-piping connections. MIP typically stands for Male Iron Pipe (it might also refer to other building materials such as copper or steel). The other component is the FIP, which stands for Female Iron Pipe. The female fitting is threaded on the inside to accept a threaded male pipe fitting of equal diameter, whose threads taper down to create a tight seal. Threaded metal pipe is made thicker and sturdier than other, non-threaded piping to better withstand accidental damage and prevent pipe failure. However, some non-pressurized plumbing systems, such as sink drains, might feature threaded connections using plastic PVC piping. Plastic threads are much weaker and prone to leaks than metal threads. MIP threaded pipe fittings are typically found in heavy-duty pipe in highly-pressurized systems, or for pipes that carry potentially dangerous materials such as natural gas. Often, threaded pipe is used to make secure, airtight connections that might need to be disassembled later on. For instance, to make replacing a malfunctioning furnace or water heater easier, it is common to use flexible metal pipe with threaded pipe fittings for natural gas and water supply connections. 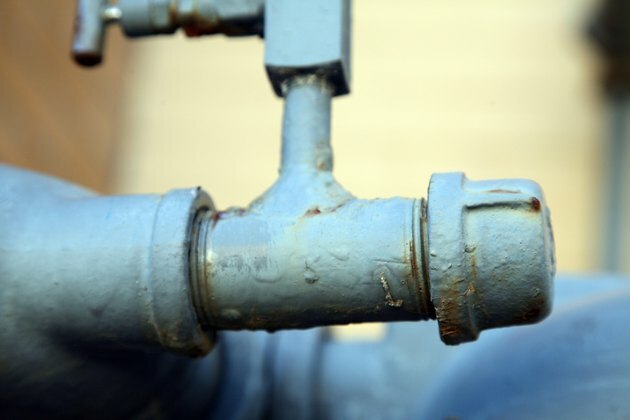 Though threaded metal piping narrows at the ends to create a tighter seal, it is still necessary to use a sealant to ensure a safe connection. Though it is common to use pipe dope (a lubricating joint compound) to seal the threads of a MIP and FIP connection, many professionals also use Teflon tape. When wrapped around the MIP component, Teflon tape creates a flexible, watertight seal that is easier to break later on if you ever need to break the seal. The application of certain MIP and FIP connections and materials is often governed by local, national and even international ordinances and building codes. For example, highly-combustible natural gas can only be piped through heavy-duty steel or iron pipe, commonly called black pipe, for safety reasons. Check with local code officials before installing or altering pressurized, potentially dangerous threaded piping systems. David Clark has been a professional writer since 2007. After working as a full-time technical writer for an architectural and engineering firm, he began freelancing for various print and online media such as "The Writer Magazine." Clark graduated from the University of Wisconsin Oshkosh with a Bachelor of Arts in English.